Dresden Bus: sightseeing bus excursions towards Berlin, Leipzig, Prague, etc. Whether you are looking for a coach, a bus or a minibus for your bus excursions from Dresden, you came to the right place! The team of Dresden Bus will be delighted to rent out coaches to you, whatever the size of the vehicle you need for your sightseeing bus tours and bus excursions. We provide charter buses for transfers and tours throughout Saxony, for example to Leipzig, as well as in nearby areas, especially Brandenburg, Berlin and the Czech Republic. In addition, our team - by working closely with the tour operator City Tours - can look after the whole planning, organization and carrying out of sightseeing bus tours from Dresden and can also help you arrange bus tours anywhere in Germany, Austria and throughout Europe, according to your personal wishes. 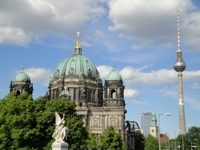 The most popular destination for a day trip from Dresden is Berlin, the German capital city. Thanks to its numerous places of interest from past and present, Berlin attracts millions of visitors every year from all over the world. From Dresden, you can reach Berlin by bus in only three hours, and by minibus in barely more than two hours. Dresden Bus suggests you to take advantage of this proximity and to undertake a full-day sightseeing bus excursion from Dresden to Berlin, and is ready to help you renting suitable buses and minibuses anytime. Of course, any of our bus excursions to Berlin will always be adapted to personal wishes and expectations. 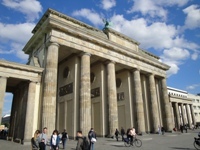 You can choose to visit numerous famous sights in Berlin, as for example the Reichstag building, the Brandenburg Gate (Brandenburger Tor: a former city gate and one of the main symbols of Berlin and Germany), Berlin Hauptbahnhof (Berlin Central Station: the largest crossing station in Europe), Potsdamer Platz (an important public square in Berlin), the Tiergarten (Animal Garden), Berlin Cathedral (Berliner Dom), Museum Island (Museumsinsel: the northern half of an island on the Spree river in the central Mitte district of Berlin), Spreeufer, the Friedrichstadt Palast (the most famous variété of Berlin), "Unter den Linden" (an iconic boulevard named for its linden trees that used to line the grassy promenade between the two carriageways), the Kurfürstendamm (locally known as the "Ku'damm", one of the most famous avenues in Berlin), etc. Close to Dresden, you can visit a culturally incredibly fascinating city: Leipzig. From Dresden, we will reach Leipzig by bus in barely two hours, in just about one and a half hours by minibus. 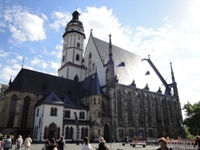 A worthwile ride, since the city of Leipzig has much to offer: from the "Schillerhaus" museum to the Gewandhaus concert hall, from the Thomaskirche church to the Church of St. Nicholas (Nikolaikirche), from the beautiful Old Stock Exchange building to the Leipzig Opera house - numerous are the sights that merit a visit. Upon demand, the team of Dresden Bus would also be pleased to provide you with a qualified guide from Leipzig for your bus excursion. Thanks to its geographical position close to the Czech border, the town of Dresden is a good starting point for bus excursions to Prague. If you rent a bus, the journey between Dresden and Prague will take you - as well as from Dresden to Berlin - about three hours with a coach, and under two hours with a minibus. 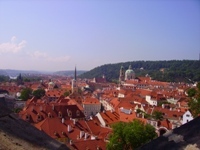 In Prague, our team will also be delighted to draw up an unforgettable sightseeing programme for you. You will thus be able to visit the Prague Castle where the Bohemian Crown Jewels are kept, cross the Charles Bridge (Czech: Karlův most), a famous historical bridge on the Vltava river in Prague, go on a guided tour through the Old Town (Staré Město), the New Town (Nové Město) or Malá Strana (one of the most historic quarters of Prague) - at your personal convenience. In addition, our team can also organize for you its favourite guided tour through Prague: the guided tour "In the footsteps of Rudolf II of Austria", based on the historical novel "Szepter und Rose" (in English: Sceptre and Rose) by Anna Ehrlich, a famous Viennese historian. Apart from the above-mentioned sightseeing bus excursions to Berlin, Leipzig and Prague, the team of Dresden Bus will gladly arrange your bus excursions towards other towns, for example to Meissen, Wittenberg, Potsdam, Weimar, Jena, Gera, Chemnitz, Zwickau or Karlovy Vary (Carlsbad). Moreover our team can also look after the preparation of your several-day bus trips within Germany, to the Czech Republic, to Austria, Poland, Hungary, Italy, France or to other European countries.
. With pleasure, we will send you a personal offer for a sightseeing bus excursion from Dresden corresponding to your personal wishes, expectations and priorities.